We all want a free lunch, we may explain why so many people cling to the myth that prisons are populated with non-violent drug offenders, and mass incarceration and racial disparities too can be resolved simply by releasing some harmless pot smokers from behind bars. But it just isn’t so, as the data below show. Some people change their mind when they see disconfirming evidence regarding something they believe. 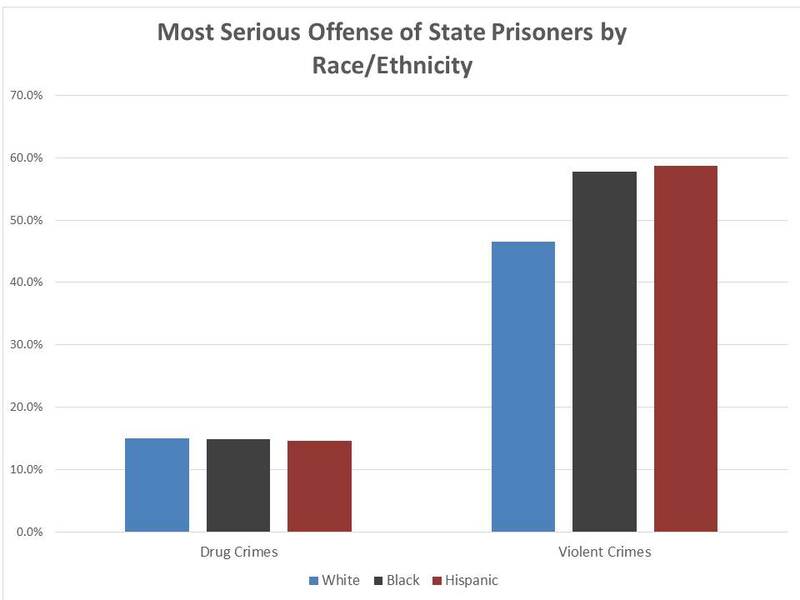 Others dig in, almost religiously, in this case by saying that these data prove even more their original view that the War on Drugs is the main cause of mass incarceration, because violence is all due to drugs and drug enforcement. Pity the faithful: a new analysis by The Economist of urban homicides shows that only 4% are drug-related, meaning 24 out of every 25 are not. If you want to see how two bold, innovative scholar-reformers are grappling with the world of prison reform as it is rather than how we might wish it to be, check out my new Washington Post Wonkblog.